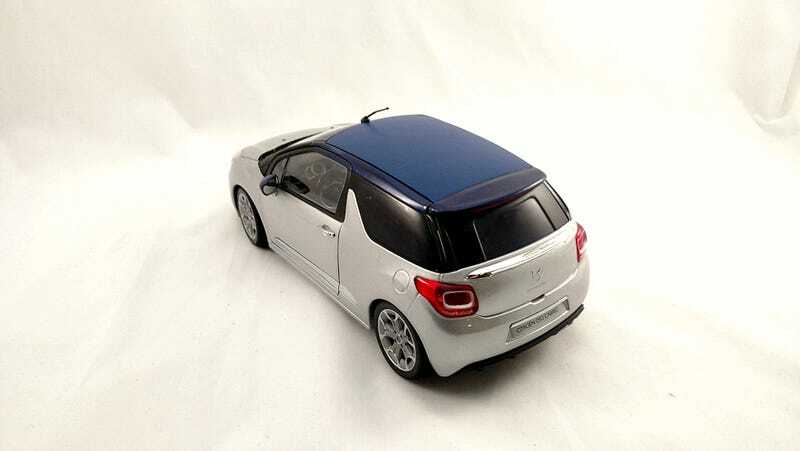 I shall be showing off my 1/18 Norev Citroen DS3 Cabrio, as requested by a certain Jobjoris. So what better a chance than to do a proper Concours D’Modella review? It’s really close to perfect, at least at this price bracket. Despite spring suspension, which usually causes cars to sit too high, it sits just right. The headlights have excellent detail, the engine is well molded (if missing a bit of color), and the wheels are better than the ones on my Kyosho and rival my Minichamps. Niggles? The aforementioned engine is a plain black blob, with very little color and the LED DRLs are painted on. Again, another place where this model scores very well. It is decently heavy, even though it’s a rather small model. It is has tight panel gaps and the photo-etched badging is well attached and not peeling at all. The paint is well applied, with no flaws. The colors , Arctic Steel and Infinite Blue, both appear to be correct when compared to the real car. The only downsides was a mirror fell off in transit, but was easily popped back into place. Also the drivers side door feels a little loose, but still functions well. White spec is a reflection of a background light, not a paint flaw or styrofoam. This model has some of the most features this side a Chinese dealer model or one that costs $150 plus. It has an opening hood, opening doors, steerable wheels, and working spring suspension as per usual. But this model has an ace up its sleeve (or trunk). It comes with a movable (sort of) roof! It has 3 plastic roof pieces, mirroring the 3 positions the 1:1 has (roof up, really big sunroof, top down). It’s a really cool feature that really completes the model, in my opinion. This model is available on American Excellence for $42, putting it solidly in the budget model category. For all the features you and detail you get, it is definitely one of the best budget models out there, and probably the best budget model in my collection. After a quick eBay check, it would appear the Arctic Steel Cabrio is the rarest color of the DS3, with a total of 7 listed as of today. The Cabrio also appears to be one of the less common DS3 variants. However, the DS3 model itself is none too rare, with 124 listings appearing after a quick search. Overall, a very solid score for a very solid car. Obviously, a small French hatchback won’t be to everyone’s tastes, but a wonderfully detailed model at a fantastic price. This model really gives some variety to my luxury/super/race theme my collection has. Overall very happy with this, far happier than I would’ve first guessed!